people with lived experience and professionals are involved as active participants (co-designers) throughout the innovation process, from defining the challenges to responding to the challenge? people with lived experience and professionals are partners, taking part in discovery work, generating opportunities and ideas, prototyping, giving and gathering feedback, delivery, as well as making changes over time? proposed approaches are monitored and evaluated from the perspective of whether they create value for the people they’re intended to serve? Are we learning together? The Fifth National Mental Health and Suicide Prevention Plan (2017-2022) lays out a clear ambition to see the people receiving care and their closest supporters as partners in planning and decision-making, taking an active role in planning, design, delivery and evaluation. To embed that philosophy within the commissioning of Brisbane South PHN’s mental health, suicide prevention, and alcohol and other drug treatment services, we’ve taken a co-design approach. We listened to people with lived experience of mental health issues, suicidal ideations and problematic substance use and their closest supporters, those working in the mental health, suicide prevention, and alcohol and other drug system and the broader community. Importantly, we reached out and listened intently to people from diverse groups whose voices may not have been well heard previously and who have important stories to tell. Brisbane South PHN’s mental health, suicide prevention, alcohol and other drug treatment service model has been informed by three key components which encompass our co-design process. Journey mapping – depicting the typical journey of a person or cohort by representing the different touch-points and experiences that characterise their interaction with a service or system. Working with a co-design group across four sessions – a co-design group is typically made of 14-17 people (‘co-designers’) who can apply their insight and work and learn together to develop new responses to the challenge at hand. Our co-design group included people with a lived experience of mental illness and/or suicide, those who work with or for people with mental illness and people who work outside of the health system who can assist by asking helpfully naive questions and thinking outside of the box. Two testing cycles, called ‘loops of learning’ – between workshops, the group’s ideas were tested through phone and face-to-face interviews, collecting feedback on what people felt might work well, wouldn’t work for them and how they might improve the idea. 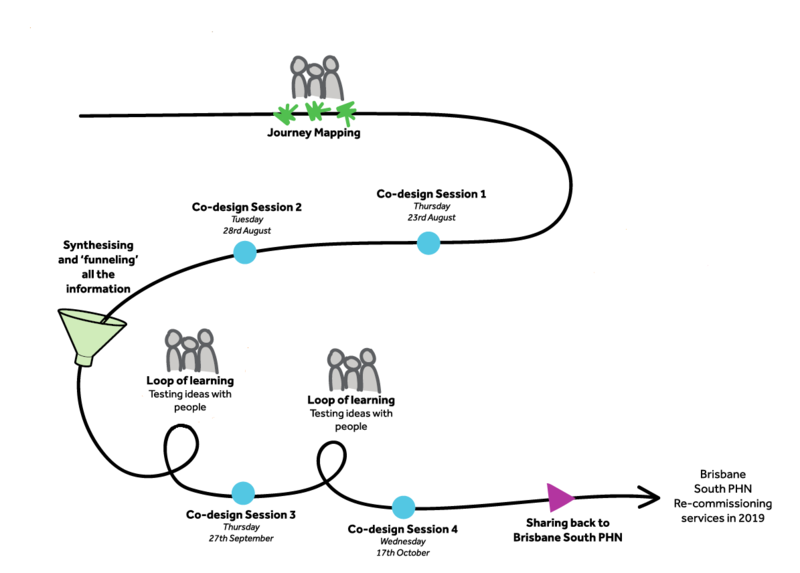 Following each learning loop we shared feedback with the co-design group, ensuring they were well equipped to adapt ideas and decide how to best move forward in informing the new service model to be commissioned by Brisbane South PHN from July 2019.